Cejay Finger Light MK10 » Protective Solutions, Inc. 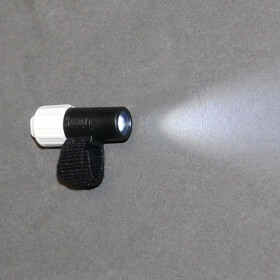 The Cejay Finger Light is ideally suited for operations requiring minimal light or situations where preserving night vision while navigating, tracking, map reading, or other close work is critical. Perfect for tactical operations. Anywhere that hands free light is needed, the finger light has found a home. Affixed to the top of the users index finger, with the included Velcro strap, the operator can easily switch the light ON or OFF by rotating the end cap. The Cejay Finger Light is a low cost, water and chemical resistant, short-range lighting tool. Several colors available, cap indicates light color (white shown in image). Size - 2" x .75" x .75"